HHS junior Jordan Fitzwater (22) carries the ball during the first quarter of the Wildcats’ 42-26 setback against Hundred on Saturday in Ashton, W.Va.
HHS senior Andrew Gillispie (11) sheds a tackler en route to a touchdown reception during the Wildcats’ 42-26 setback against Hundred on Saturday in Ashton, W.Va.
ASHTON, W. Va. — The Wildcats scratch and clawed, but the scoring came just a bit too late. 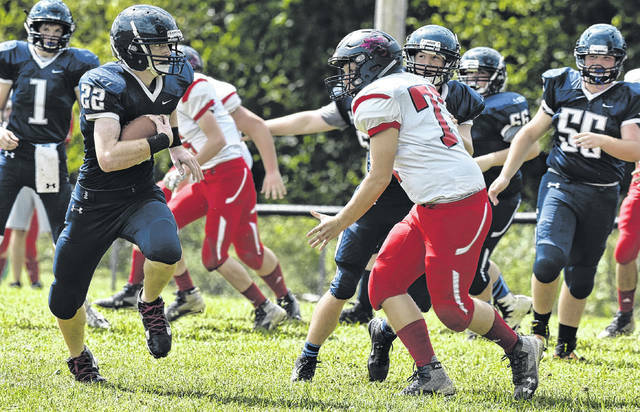 The Hannan football team put together a solid defense effort in the first quarter and spirited offense in the fourth period, but visiting Hundred generated too much scoring in between on Saturday as the Hornets stung the Wildcats en route to a 42-26 victory at the Craigo Athletic Complex in Mason County. The win for the Hornets (1-3) ended a 49-game skid, dating back to the 2010 season. The Wildcats (0-4) threatened on their first offensive drive of the contest, but a 12-play 58-yard drive stalled as Hundred halted the hosts seven yards from the end zone. Both teams were held scoreless in the first period to enter the second quarter knotted at 0-0. 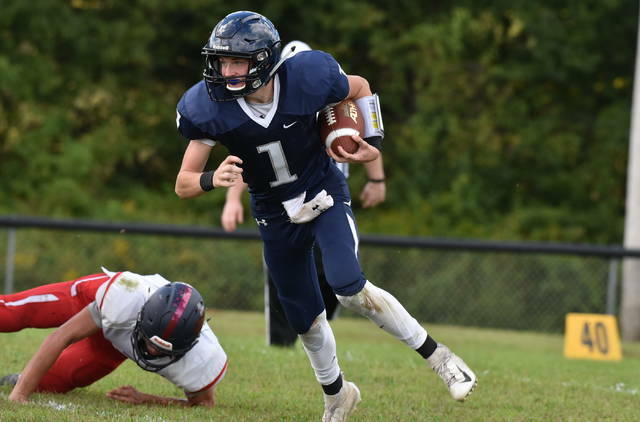 Hundred, however, opened the scoring when Andrew Zedell closed out a nine-play 50-yard drive with a 3-yard rushing touchdown to propel the visitors to a 6-0 lead with 11:55 remaining in the first half. The Hornets extended their advantage to 14-0 with 27 seconds left before the intermission, when Zedell capped off a 10-play 95-yard drive with a 8-yard run and connected on a pass with Martin Baker for the two-point conversion. 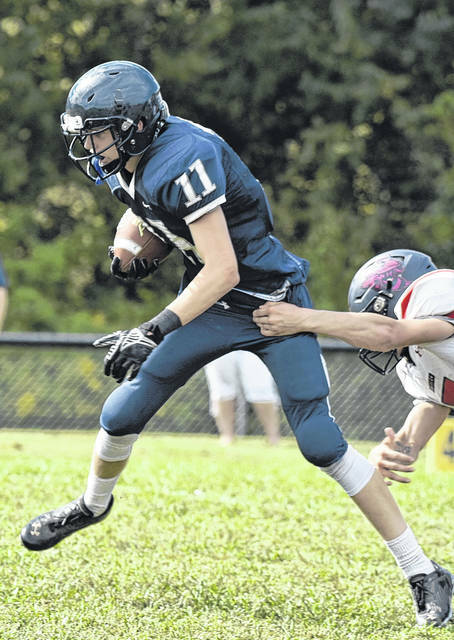 Following the break, Hundred furthered its lead to 22-0, as Skylar Goff took a 65-yard kickoff return into the end zone and Zedell followed with a two-point conversion run with 11:48 remaining in the third quarter. Goff tacked on the visitors fourth touchdown of the game, at the 6:01 mark of the third, with a 35-yard rushing touchdown to increase the deficit to 28-0. Hannan cut the deficit to 28-8 just 13 seconds later, as Matthew Qualls connected with Andrew Gillispie on a 70-yard pass. Christopher Exline snagged a pass from Qualls for the two-point conversion to close the gap to 20 points with 5:48 remaining in the third period. Hundred, however, pushed its lead to 36-8 on its first play of the following drive, as Goff scored on a 72-yard rushing touchdown. The Wildcats narrowed the margin to 36-14 at the 3:33 mark, as Skyler Nance capped off a three-play, 72-yard drive with a three-yard rushing touchdown. Hundred, however, closed the third quarter with a five-play, 52-yard scoring drive, concluded on a 27-yard run by Zedell to push the lead to 42-14. Hannan accounted for all of the scoring in the finale, as Qualls connected with Dylan Starkey on a 50-yard pass with 11:38 remaining in the contest to narrow the lead to 42-20. The Wildcats finale touchdown came with 8:44 left in the game, as Gillispie hauled in his second touchdown reception of the contest to close the margin to 42-26. Neither team produced any further scoring the rest of the game, as Hundred closed out the 16-point victory. Both squads ended the contest with two turnovers apiece, as the Wildcats threw two interceptions and the Hornets lost two fumbles. The Wildcats also had 10 first downs in the contest, while Hundred finished with nine. Hannan committed nine penalties for 65 yards, while the visitors were flagged for seven penalties for a total of 50 yards. Qualls finished with a 9-of-22 passing performance for 271 yards, throwing two picks and three touchdowns. Four different Hannan players caught at least one pass in the setback, with Gillispie lead the way with five catches for 198 yards. Starkey hauled in four grabs for 62 yards, while Dominic Burris had two catches for 38 yards and Jordan Fitzwater made one grab for five yards. Logan Barker paced the Wildcats’ rushing effort with 12 carries for 41 yards, while Qualls added 18 yards on four carries. Next for the Wildcats is a home date with Van on Friday.